We cater to all of our clients’ needs in a professional manner. We do not claim to have a particular style. We are adept at listening, organizing and then creating a memorable event for all of our clients! No there is no limit. We have an on-line planning system that will help you to choose music. We also have some tips on requested music that we can review as we work together. A suit is standard for all events. Some clients have made other suggestions for their particular event. No, we have an extensive collection of music through nine decades. If you do not locate a song in our database, please let us know so that we may add it for your special day! How many other DJs do you work with? We have a total of five experienced, knowledgeable and well trained professional disc jockeys. What is the minimum amount of time you will DJ for? We require a three to four hour minimum. Is the client able to meet the DJ before booking? Yes, absolutely! Please call for a personal consultation. Do you specialize in any ethnic or international events? 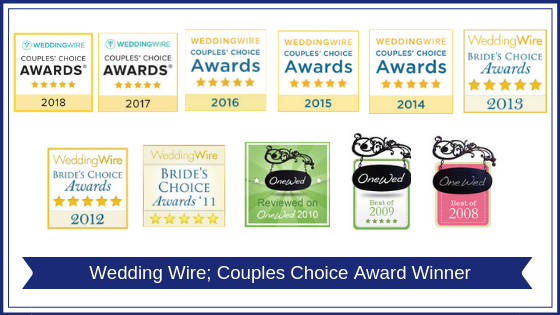 We have been lucky to have been a part of so many diverse types of celebrations! Please let us know what you are looking for so that we may better serve your needs! Can the client submit a do-not-play list? Yes, it is your day! As we work together we will have some tips for you. We have all of our own equipment plus back up equipment on site for every event. What (if any) special equipment, such as lighting, is offered with your service? We offer party lights, uplighting, plasma tv’s, along with screens, projectors and photo booths. How much time do you usually need to set up? Do you require that the site or client provide a table for you to set up on? Set up time varies by which package the client chooses. Please call for details. Do you have any extra space requirements? Do you have a sign or banner that you use at events? No we do not. We hope that a successful event is the best form of advertising. We have business cards available at each event. Our professional disc jockeys make all necessary announcements. Any other emceeing or interactivity is at the discretion of the client. What is your policy on taking breaks? If you require a meal break, do you require that the client provide your meal? Our main concern is making your event special. No breaks are required and meals are given at the discretion of the client. Do you book yourself for more than one event in a day? What is your overtime rate? The overtime rate is $100.00 per half hour. Enter the date of your event below, and find out immediately if your date is available. We accept all major credit cards for your convenience.